A Pennsylvania man's unsuccessful efforts to nurse an injured deer back to health have drawn the ire of the state's game commission, who might fine him for daring to transport the animal to his home. The story started Saturday at Gifford Pinchot State Park in Warrington Township, where five deer had fallen through an icy lake. For hours, John Stoll Jr. aided park officials, fire department personnel, and Pennsylvania Game Commission officers in the rescue effort. Three of the deer survived (one made it to safety on its own), and a fourth drowned. The fifth deer, a pike buck, was brought up to shore, though it was badly injured. Stoll tells The York Dispatch that rescuers took it to the opposite side of the lake from where he and two game wardens were. Stoll quickly made his way to the other side of the lake and put the injured deer in his truck, believing the game wardens would have euthanized the creature or let it die. "I don't even know how far [the wardens] made it before I actually got the deer," he tells the Dispatch. He had good reason to hurry. According to Pennsylvania Game Commission Press Secretary Travis Lau, there's "a good possibility the deer would have been euthanized...because deer are poor candidates for rehabilitation." "As a rule they're not rehabilitated," Lau tells Reason, though he noted it's difficult to say what would have happened. So Stoll drove the deer home and tried to save it. "Nobody said I couldn't take it," he tells the Dispatch. 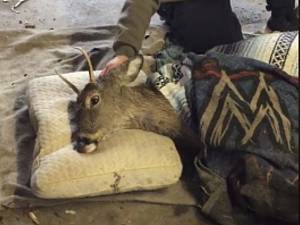 A series of Facebook videos show the deer in his garage, covered in blankets with its head rested on a pillow. But Stoll's efforts were to no avail. "We have some sad news," he says in a video posted to his wife Terri's Facebook page on Sunday. "Our main little boy—he did not make it." Stoll later buried the animal, telling the Dispatch that he and his family "were so devastated." But that wouldn't be the end of it. On Monday, a game warden paid the family a visit. Stoll wasn't home at the time, but the warden asked his stepson questions. Later, the warden told Stoll over the phone that he might be cited. "He said it's unlawfully taking wild game from the wildlife and taking him home," Stoll tells the Dispatch. He says he was warned that he could receive two fines, one for $100-$200 and another for $400-$800. What had Stoll done wrong? Speaking to the Dispatch, Lau explains that "all wildlife in Pennsylvania is protected—no one owns it." Speaking to Reason, he adds: "When any wildlife is rehabilitated, it's required to be done through a licensed wildlife rehabilitator. Your average Joe can't just take in an animal and rehabilitate it." Stoll acknowledges the law. But he believes he still did the right thing. "In the long run, I just feel like we gave the guy a chance," he tells Reason. The deer likely wouldn't have survived out in the cold, but "at least I gave him a chance." Stoll has not yet been charged, according to a statement published today on the game commission's website. But "the situation remains under investigation," the release adds. And Lau suggests that Stoll might be looking at more than two violations. This isn't the first time that government officials have taken the phrase "no good deed goes unpunished" literally when it comes to animals. In 2013, Washington Post reporter (and former Reason staffer) Radley Balko noted the case of Giggles, a baby deer who had been taken in by an animal shelter. Thanks to a state law banning wild animals from being adopted, Wisconsin Department of Natural Resources killed Giggles. Then there's the case of Tammie Hedges, a North Carolina woman who sheltered pets during Hurricane Florence, only to face criminal charges. The charges were eventually dropped, but only because the county was getting bad publicity. Stoll says if given the chance, he'd "100 percent" make the same decision. "I'd do it all over again," he says.